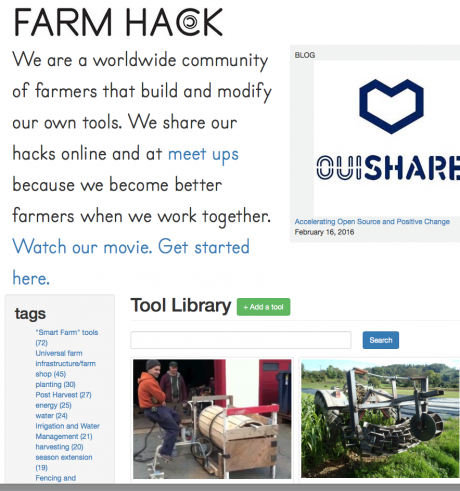 Farm hack - global online platform full of blueprints to be adapted to others' needs. Screen shot.We see ourselves as commoners. Therefore we welcome the initiative by the Convivialist Manifesto authors to bring together diverse persons and organisations, positions and discourses in a shared process. This will always be evolving; but a process appropriate for an ‘art of living together’ that is viable for the future. We are glad to accept this invitation to contribute to the ideas and suggestions outlined in the Manifesto in the same spirit. Under the title “The mother of all threats“ (LC: 23)3 – the Manifesto identifies its central question, “how to manage rivalry and violence between human beings” in the context of the great problems of humankind. This question seems well justified as rivalry and violence are obvious features of our living together. They can neither be ignored nor explained away. However, if we do not delve down to their structural roots, we may get the impression that we should look for the causes solely in human nature. e.g. in the fact that “every human being aspires to have their uniqueness recognized“, while a “healthy society” knows how “to prevent that desire from degenerating into excess and hubris” (LC: 25). Consequently the Manifesto poses the “moral question [...] what may individuals legitimately aspire to and where must they draw the line?" (LC: 26). The authors point out that “we have to make conflict a force for life rather than a force for death. And we have to turn rivalry into a means of cooperation, a weapon [sic!] with which to ward off violence and the destruction it entrains“ (LC: 25). However, they do not address satisfactorily how such a transformation could be reached by means of moral imperatives or political measures. In such roles people have to aim to get the most out of every exchange (such as a material or immaterial good, or human labour) at the expense of others. Personal relationships are preformed by this predicament. “Every area of life, down to emotions, friendships, and loves, found itself subject to the logic of accountancy and management” (LC: 28). In this system one progresses by pushing the other down. Being "greedy", "corrupt", “excessive" and "unscrupulous " is a functional behaviour which is often promoted by society. A convivial society which promotes living-in-community would have to place the foundations of life into the centre of its activities. This includes the natural foundations of our existence which in capitalist contexts are resources that primarily exist to be exploited and commodified. A convivial society which promotes living-in-community would have to place the foundations of life into the centre of its activities. This includes the natural foundations of our existence which in capitalist contexts are resources that primarily exist to be exploited and commodified. The Manifesto formulates four principles of the “only legitimate kind of politics”: “common humanity, common sociality, individuation and managed conflict” (LC: 30). Even though it is debatable whether the “social nature of humanity” encompassed by the first two principles is truly a definition of the human condition or a political principle, it certainly makes sense to us to bear in mind that we are one humanity and that people are social beings. Likewise we support the aim connected with “individuation” to allow “each of us to assert our distinctive evolving individuality as fully as possible by developing our capabilities, our potential to be and to act without harming others' potentials to do the same, with a view to achieving equal freedom for all” (LC: 31). And last but not least the term “managed conflict” means to “be individual while accepting and managing conflict” (LC: 31). It is critically important that these four principles are not mistaken for prerequisites to action in the sense of moral imperatives. Given favourable structural preconditions, actions tend to bring about these principles. Experience in many projects shows that commons work best when they not only allow inclusive action which cares for others and their concerns, but actually facilitate such action and make it difficult to act otherwise. The logic of inclusion of the commons is geared towards the development of the unique qualities of the individual person as a prerequisite for the flourishing of all people. If this succeeds in the context of the commons it could look like this: a person learns a new skill which he or she can then contribute. This will help everyone because tasks at hand can be done better, more easily or by more people. The larger the pool of skills which can be used collectively, the better. This type of relationship of positive reciprocity, of potential promoting reciprocal referentiality, differs fundamentally from that of negative reciprocity in the structurally exclusive logic of commodities. This type of relationship of positive reciprocity, of potential promoting reciprocal referentiality, differs fundamentally from that of negative reciprocity in the structurally exclusive logic of commodities. Rather than creating isolation it creates a structural communality (Meretz 2014). The problem becomes even clearer when we take another look at the logic of the commons. In this logic people have the opportunity to internalize their various needs and communicate them ex ante. Internalising means to integrate all needs and to look for a way to fulfil them comprehensively. If this happens before or in the course of production, of a project or process, it becomes possible to co-ordinate the different ideas and wishes, and to negotiate conflicts in a way that ensures that no-one asserts himself at the expense of others – e.g. due to power imbalances. This is not easy and the prevailing restrictive conditions mostly put spanners in the wheels of people who are involved in such projects. Fundamentally though, the logic of inclusion in the commons provides a framework for the structural ability to be responsible. This is no guarantee for good solutions. Nevertheless, only those who have at their disposal the productive means and resources for self-determined production of living conditions, even have the option to act responsibly with regard to the whole. On the other hand, an approach which focuses exclusively on “nature protection” is often accompanied by the displacement of people who have lived for centuries in territories which are now declared as nature reserves. Their presence is seen as harmful to nature. It is absurd, however, to protect nature against or from people. If humans and nature are understood as belonging together, nature can only be protected along with the people. Ever since people have existed, many communities have lived with their non-human environment under diverse conditions. They were not intruders but part of this natural environment and did not only take from nature but also gave back to it and shaped it. Such a relationship between humans and the non-human environment which does not endanger the latter, and therefore humans, is indispensable. But under the current structural conditions it is hardly achievable. The capitalist economy in its commodification and growth compulsion has taken on a life of its own in opposition to ecology. However, in its original Greek meaning of prudently managing a household, the term economy refers to striving to fulfil everybody's needs using available resources. Nevertheless we do not want to idealise such projects. All currently existing commons projects have to address problems and sometimes do so in contradictory ways. It has become evident that all these beginnings have to survive in the structurally hostile environment of the capitalist market economy. Therefore financing the projects is an issue time and again. It has become evident that all these beginnings have to survive in the structurally hostile environment of the capitalist market economy. Therefore financing the projects is an issue time and again. Within the real world settings, they keep having to ask themselves the difficult question, to what degree they will engage with the market logic or manage to resist exchange logics even in their financing (e.g. by crowd-funding, foundation financing or donations). We are confident that commons can embody the “mode of living together [...] that values human relationships and cooperation and enables us to challenge one another without resorting to mutual slaughter and in a way that ensures consideration for others and for nature” (LC: 25). However this is not because commoners are better people or follow ethics that others have not yet understood, but because commons are a qualitatively different way of creating living conditions – a way in which it is functional to be inclusive instead of exclusive, resource efficient instead of wasteful, guided by needs and not by return on investment.